Elevate your poster design to the next plane with this yoga class poster template. Breathe in deep and feel your body relax because the Yoga Class Poster will have you ready to teach yoga in no time! If you want to advertise your yoga class, say it with this relaxing Yoga Class Poster! You can customize it to highlight important aspects of your class such as strength training, power yoga, or benefits of flexibility. 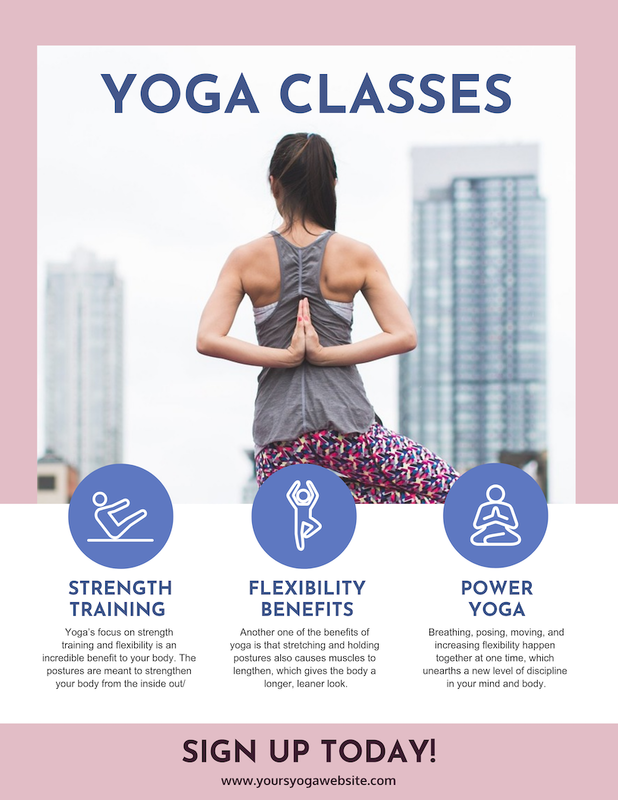 The Yoga Class Poster template can also be customized to include your website, location, times and dates, as well as if you’re offering a discount for first-time students. The Yoga Class Poster template is flexible just like yoga and gives you the option to upload an image or choose from our large gallery of quality stock images and icons. Whether you want your students to find peace or strength, the Yoga Class Poster is the perfect choice!